The leading scorer in the last Premier League season, leading England's line this month in the European Championships. At 22 years old, just two years after his first Premier League start, Tottenham striker Harry Kane appears unstoppable. Now, for a special BBC Radio 5 live documentary, the coaches, players and managers pivotal to his remarkable rise reveal the secret stories and key characteristics that transformed a six-year-old stand-in goalkeeper from the north London suburbs into the most exciting young forward his country has produced in a decade. This is the making of Harry Kane. North-east London, autumn 1999. Ridgeway Rovers, the youth club that also produced David Beckham, is holding its annual trials. In charge of coaching is Dave Bricknell - long-time Tottenham supporter, now a Spurs scout, football obsessive. "This six-year-old boy turns up at Loughton rugby club, and we're doing a little shooting session, and I ask for a lad who can go in goal," says Bricknell. "This little boy puts his hand up and says: 'I'll go in goal.' So we give him some gloves, and he performs heroics - makes some fantastic saves. "I think, yes, I've got a goalkeeper here - because goalkeepers are very hard to find, particularly at six. They do it for five seconds and they want to be a centre-forward. "Then I get told he's not a goalkeeper, he's on pitch. So I think OK, and I stick him on pitch. And he's scoring loads of goals, on a very long pitch as well, so he ends up being our striker. "He could see a pass, he could play. He was very, very good at an early age. He could strike a ball. "But Harry's best attribute was his great self-belief. He had good touch, but his main attribute was that he had major confidence in himself. "He would score lots of goals, but if it went wide and he didn't score, he wouldn't worry about it - he'd just go and get his next chance and try to score again." Impressed by the eight-year-old Kane's goal-scoring displays for Ridgeway, Arsenal take him into their set-up. Two years later they decide others his age have more. Watford also take a look, and also turn him down. Aged 11, Kane has one final chance - at his local club Spurs, and with his school team at Chingford Foundation. He is determined to take it. "Aged 11 Harry was technically very gifted, with a great first touch, and a very clever player; he always knew where to go, right from an early stage," says Mark Leadon, Kane's PE teacher. "He was also a very good cricketer - he opened the bowling from year seven to 10 and batted at four or five. But he loved his football. He was never a prima donna, and he would always put a shift in. Some students think they're better than others, but not him. "Yet what came through more than anything else was his determination to succeed. He's always wanted to make a mark - and from a very early age you could see how driven he was." PE teacher Mark Leadon said Kane was a "real team player" and "wasn't one to keep the ball if a pass was on"
Alex Inglethorpe, formerly Tottenham youth team coach, says: "When I joined Spurs as under-18 coach, Harry was aged 13. Part of my remit was to work with the under-14s, so every Wednesday evening we'd get together. "I'd like to say he was the gold medallist in the group and that we'd all spot he was going to be the fantastic player - but I'd be lying. He probably wasn't even on the podium. "He had a lovely technique - an ability to pass and receive and shoot - but if there was something that endeared him to you it was that he was very, very low maintenance. Inglethorpe, now director of Liverpool's academy, sees Kane sign scholarship terms with Tottenham on his 16th birthday in July 2009. Alongside fellow coaches John McDermott, Chris Ramsey, Les Ferdinand and Tim Sherwood, Inglethorpe sets about developing their young, imperfect talent. "It became fairly evident when Harry became a scholar that he was someone who could finish," says Inglethorpe. "He wasn't great with his head and he wasn't great on his left side, but he was his own best coach. "That boy at 13, who didn't have everything, taught himself an awful lot more in those five years that followed. He was very aware of what he didn't have and very aware of what might stop him - and he was very determined to make that right. "And that ability to self-evaluate and then reflect on where he was wasn't a sit-down process as we might as adults; he'd worked out in his own mind how to be successful. He was wonderfully demanding as a player to coach because he always wanted to stay out and do extra. "It was always 'come on, five more' or 'just a few more finishes'. My role was a very easy one: it was to get the ball out of the bushes and start again. "We just had to keep giving him opportunities to get good at what he needed - to get better at heading, to get better on his left side. That obsession to improve is undoubtedly his greatest strength." Tim Sherwood, former under-21 coach and first-team manager at Tottenham: "Harry trained like every day was the last day in the world. "When you talk to Harry Kane, his eyes are wide open and he is listening to everything you are saying and he is absorbing it, learning all of the time. "If he didn't understand it, he would ask questions. He was a coach's dream to look after, because you only had to tell him once and it was in there and he would try to apply it on the field." Former Tottenham boss Tim Sherwood said handing Kane his Spurs debut "didn't feel a gamble"
January 2011, and the 17-year-old Kane is sent away on loan to League One Leyton Orient. Away at Rochdale, in front of a crowd of just 2,731, he comes on as sub in the 73rd minute for Scott McGleish - a 36-year-old veteran striker, 216 goals in 572 League appearances to his name and a man obsessed with the art and effort of scoring goals. "Harry was not like other Premier League players, where you feel they're going to come in 'Billy Big Time', a bit of a Charlie boy," says McGleish. "He wanted the experience of learning what I call men's football. He could play the 18s and the 21s, but he wanted to learn - and from the word go he was ready to fight for his place. "In training, he was willing to learn from everybody, and even more importantly willing to just knuckle down and work hard. "You could see in training and subsequently the matches that he had ability and a desire to go further, but you're still looking like a young 17-year-old: very slight, still needing to physically develop, not the quickest but technically excellent. "The good thing for Harry was he was willing to go out and learn at Orient first of all. To me, that's big credit to him; he was ready to take the step down, to play in League One where it is a little bit more physical rather than technical. Where it is a bit more 100mph, instead of just a testimonial pace like the under-21s is." Kane's goals for McGleish's Orient - five in nine starts - draw the attention of struggling Championship team Millwall and their manager Kenny Jackett, who knows Sherwood from their time together at Watford. Waiting for the 18-year-old Kane at the New Den on New Year's Day 2012 is club stalwart and hard-man defender Alan Dunne - 10 career red cards to his name, 85 yellows. "I've seen a lot players come to the Den and freeze, because within five minutes they're being called names that they've never heard before and they can't cope with that pressure," says Dunne. "Harry had that in the back of his head, because it's always spoken about when young players come in. But it didn't faze him - he was a focused lad, he was confident in his ability. It was a challenge to him, and a challenge that he rose to. "I wasn't the most skilful player, but I was passionate and no-nonsense, and I would never pull out of tackle and would do all I can to win a game. "Harry saw that and he realised that at Millwall you need to have a little bit of aggression in you, have a little bit of pride and show you want to wear the shirt. Harry, aged 18, did all that." Sherwood adds: "I used to watch Harry a lot at Millwall, and it was an intimidating atmosphere. I remember overhearing one of our scouts come and talk to Harry Redknapp - who was Spurs manager at the time - and say 'we need to get Harry Kane out of Milwall, it's no good for him there'. "I went straight in, as I would, and said: 'What did you say? This is the perfect atmosphere for him. We don't want him to be in a comfortable environment, we want him to be playing under pressure all of the time.'" Nine goals in 26 starts both win over the anti-Spurs Millwall faithful - Kane is voted the club's young player of the season - and save them from relegation. By the start of the 2012-13 season a more compete striker is emerging: one who can now score goals from near and far, with head up or head down. "The variety of his goals is very, very good, and you could see that in training. He worked on all the different types of finishes, worked on left foot, worked on his right foot and worked on his heading," says McGleish. "You get some players who are the fox in the box, looking for a little bit of space. Harry can now receive it tight, shift it, strike. He can get a defender, run at them, shift it. Outside the box, 25 yards, top corner. "Left or right foot he hits targets. He now makes the keeper work almost every time. For a striker to be able to do that is very, very good." Dunne adds: "If there's one word to describe his finishing, it was immaculate. "People say immaculate isn't really a football word, but he would find each bottom corner the same time, every time. No scuffs. It wasn't top corners, it was bottom corner, bottom corner, bottom corner." "Hitting the corners is something he's trained himself to do," says Inglethorpe. "It's like any skill; if you're determined to acquire it, you will. I'm not a believer in it all being natural; I believe in working talent, and Harry is a working talent. "He is someone who has realised that if you want to score a volume of goals, you have to be able to score with right foot, left foot, one on one, outside the box, inside the box, with your head. He's taught himself to do that - and he's still as obsessive now as he was then." McGleish adds: "Harry learned where the goal is because it's all about the markings on the pitch. He'll know by markings on the pitch where he is and from that he knows where the goal is. "So he doesn't have to look up now. He knows that if I'm here, right, I've got to do this type of shot. And it came from practice, just purely the willingness to want to improve." "I saw Harry score the greatest single goal I've ever seen scored," says Dunne. "This is in training, and it was out of nothing. The ball was thrown long by the 'keeper, and Harry's caught it on the volley at an angle where it didn't look possible that he could score. "Our jaws all just dropped. 'Wow, how's he just done that?' It was an incredible technique and finish. If anyone else tried, one in a million might go in." A third loan spell, this time with Norwich and another Spurs connection in then-manager Chris Hughton, is cut short by injury. Now aged 19, Kane is instead sent in January 2013 to Nigel Pearson's Leicester, but cannot get in the team ahead of Chris Wood and David Nugent. He will sit on the bench with another struggling striker, Jamie Vardy, before spending the summer with England at the Under-20 World Cup. "Leicester came to the Den. We were winning 1-0, it was on TV, and I'd scored the goal," says Dunne. 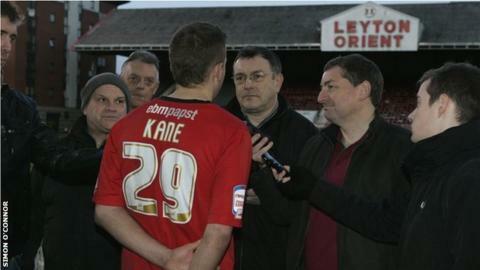 "I remember Kane coming on and I thought, right, this could be trouble. "He didn't really look at me. He didn't even shrug his shoulders. I kept trying to wind him up and wind him up and I couldn't get anything from him - and I would have probably gone through him, because we were desperate to win that game." Peter Taylor, England under-20 coach in that summer of 2013, adds: "The impression I got was firstly what a nice boy you are, and secondly that you're not going to have regrets at the end of your career, because you're going to give it everything you have to be a player. "I've dealt with League One and League Two players, and you might have to keep reminding them about things. Harry you only had to tell once. He's a very intelligent player. "He would enjoy every training session, but only if it had reason. [Former England forward] Teddy Sheringham used to be like that. 'Why are we doing this?' Harry thought about every session. "I would be amazed if he didn't finish every season and say: 'Right, what did I do well, what could I have done better?'" Spurs are a club in flux. Andre Villas Boas is sacked, and Kane's great supporter Sherwood takes over. On 7 April 2014, three months short of his 21st birthday, Kane is finally given his first Premier League start. He scores against Sunderland. A week later he repeats the trick against West Bromwich Albion. "It didn't feel a gamble at all to give Harry that start. It was almost overdue to be honest," says Sherwood. "Roberto Soldado was in front of him in the team, and nobody wanted Roberto to do well more than me - but every single day in training Harry was outperforming him. "After probably three weeks, I decided I had to make that change and I had to bring Harry into the team. He didn't let me down. "Harry wanted to get the top, and nothing was going to stop him achieving that because of the ability, desire and mentality that he possesses. "He needed to work on sharpening his feet up around the box, and so we spent a lot of time doing sessions where he had to move his feet a little bit quicker, open the space and shoot off both sides. "But he also had that knack of being aware of players around him, and had the intelligence to slide people in. He could see a pass and he could execute it. "I was the biggest believer Harry Kane ever had, because I used to think he was a mix between Teddy Sheringham and Alan Shearer, both players I played with. It's a big accolade, but I think it's the right one." Two years on, Kane has scored 64 goals in 94 starts for Spurs. Now 22, he appears to have everything his club and country would want from a striker - the ability to poach and the ability to score from distance; able to lead the line or drop short, to play on his own or in a pair, capable of scoring off either foot or with his head. Is this where the story ends or will the making of Harry Kane go on and on? "As he carries on in his career you'll see that determination again and again," said Leadon. "He won't just want to score for England, he'll want to win things with England." McGleish adds: "I'm 42 now, and I still play football for Wealdstone in the Conference South now and again. It's not because I'm getting vast amounts of money, it's because I love football. "Every level I've played at, it was never about the money or the status. And if you look at Harry, who's probably on anywhere between £50,000 to £100,000 a week, if you asked him to play for a fiver he'd probably still do it. "He loves football, he wants to play football. That's why he does all the extra sessions. "He's probably a nine and a half out of 10 in every department, but that's not good enough for him. He'll want to be 9.6, 9.7, and then get to 10. And he does it for enjoyment as much as improvement. That will never change."